12 Favorite Places in San Diego to Read and Write. – Cool San Diego Sights! 12 Favorite Places in San Diego to Read and Write. The spacious Reading Room at downtown San Diego’s Central Library. Do you love to read or write? I have a number of favorite locations in San Diego where I can pick up a book or pen while enjoying a pleasant view and relative peace. I find these places to be comfortable, inspiring and expansive for the mind. But, of course, my list is completely subjective. One can find countless benches, tables, parks and beaches in sunny San Diego. Some readers and writers might like to place themselves in a coffee shop, or at the center of a bustling scene. Others might like to be surrounded by natural or artistic beauty. Others simply want solitude. Personally, I prefer the latter two–with a bustling scene in the quiet distance, perhaps. Downtown San Diego’s large new Central Library is just a wonderful place all around. But perhaps its best feature is a gigantic eighth floor Reading Room, crowned by the building’s fantastic lattice dome. 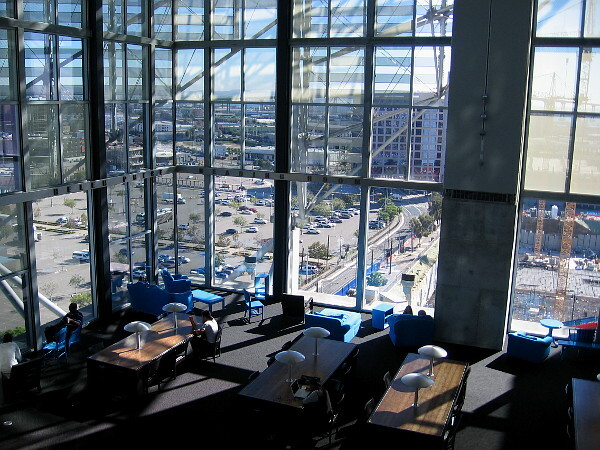 Comfortable sofas and easy chairs allow patrons to gaze through enormous windows out toward San Diego’s South Bay. And the Reading Room is so nice and quiet. 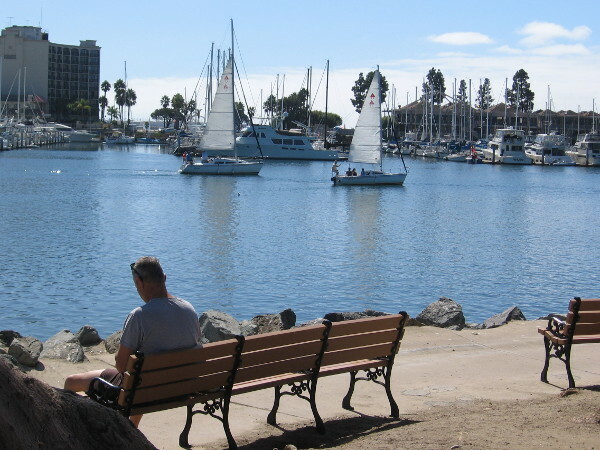 Benches can be found overlooking moored boats in San Diego Bay’s Crescent Area. Any bench near the water in San Diego Bay’s Crescent Area. If you don’t mind the occasional company of homeless people, San Diego Bay’s Crescent Area is a fine place to stretch one’s legs and mind. It’s a not-very-touristy stretch between the Grape Street Pier and the Coast Guard Station, with a number of comfortable wooden benches facing picturesque boats moored in the bay. Bicyclists and joggers pass by frequently and gulls and pigeons swing by for an occasional visit. The wide view, stretching across the bay to Point Loma, always puts me in a thoughtful mood. 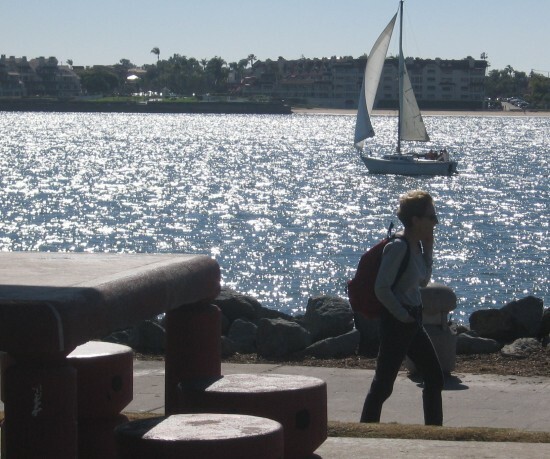 Picnic tables at Embarcadero Marina Park North offer views of sparkling San Diego Bay. Picnic tables near the water at Embarcadero Marina Park North. When writing, I like mental peace. I find this state of mind can be most easily reached inside a happy, carefree atmosphere. So I often seek out an available picnic table near the water at Embarcadero Marina Park North. The blue bay sparkles, boats sail past serenely, families laugh on the grass, colorful kites glide overhead. Sometimes I just sit and do nothing. 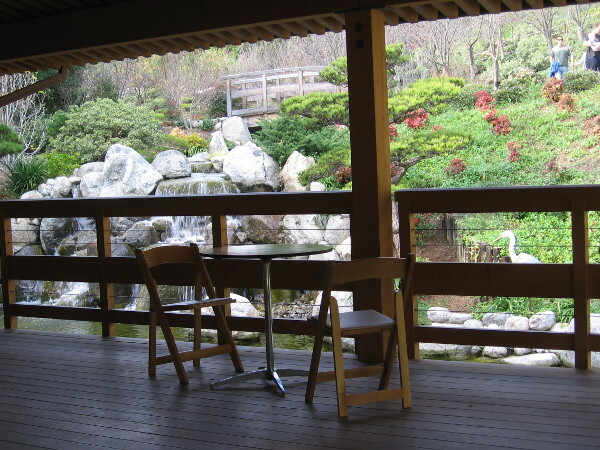 Several tables are usually open on the deck of the Inamori Pavilion at the Japanese Friendship Garden. The Inamori Pavilion at the Japanese Friendship Garden. Would you like to sit at a table overlooking a tranquil koi pond and waterfall? I would! That’s why I have become a member of the Japanese Friendship Garden in Balboa Park. I wrote two short stories recently while sitting at one table. They are titled An Old Man on a Bus and Waterfall Tears. You’ll likely find solitude in the beautiful Administrative Courtyard in Balboa Park. The little-known Administrative Courtyard in Balboa Park. I discovered this perfect, blissful park a couple of years ago. 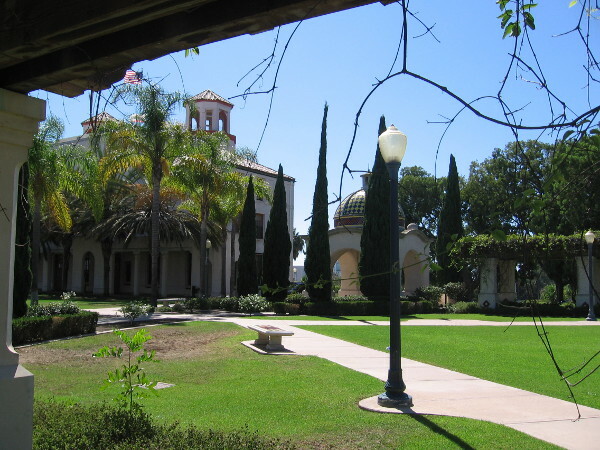 It’s called the Balboa Park Administrative Building Courtyard and it’s located in the park’s Inspiration Point area, behind the Balboa Park Administration Building. Almost nobody goes there. You might have the entire beautiful place all to yourself. A perfect sunny place to really concentrate. 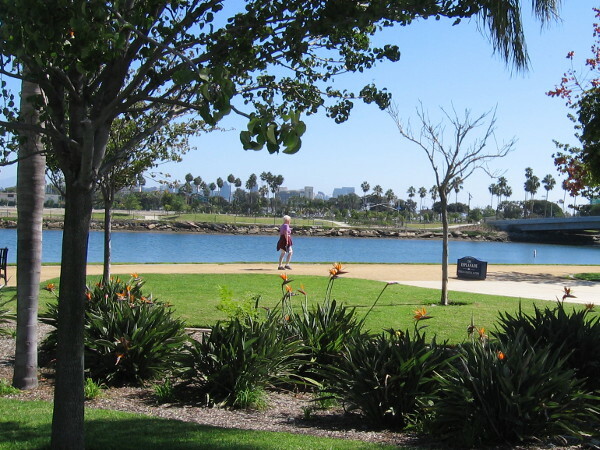 Shelter Island offers shade, grass, trees, and wide views of San Diego Bay and the downtown skyline. A bench, a picnic table or the grass on Shelter Island. I love Shelter Island–especially the southwest end. Few tourists, great views, grassy lawns, a wonderful pier. When I walk along the park-like paths I feel as though I’m on vacation. Many benches and picnic tables along the length of Shelter Island make ideal places to read or write. Or just bring a blanket and lie down on the grass. It’s so pleasant you might fall asleep! 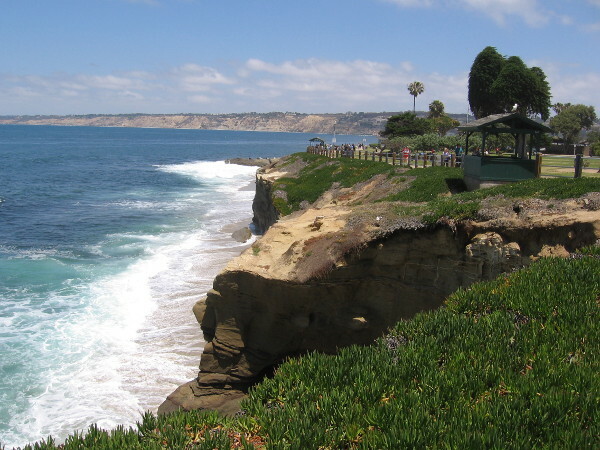 The area around La Jolla Cove is so magnificent, you might do nothing but sit in one spot for a long while, taking in the scenery. A spot near the ocean at Ellen Browning Scripps Park in La Jolla. When you’re visiting one of the most beautiful locations in the world, of course you’ll feel inspired. After finding a spot to read or write for a bit, get up and walk along the cliffs. Breathe in the fresh sea air. Watch birds, seals and the endlessly crashing waves. You’ll feel so alive. 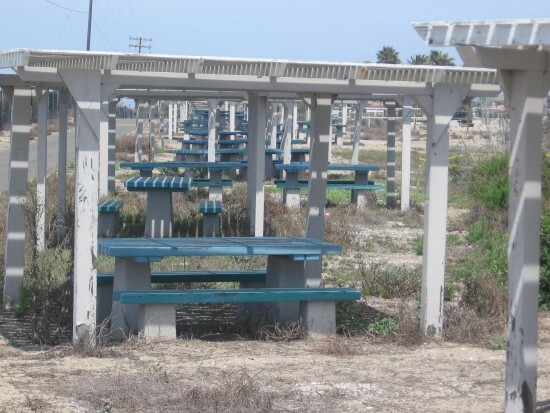 Many picnic tables are often unused at Silver Strand State Beach. An ideal spot to quietly read or write. An isolated picnic table at Silver Strand State Beach. Silver Strand State Beach can be lonely, especially off-season and on the San Diego Bay side. There are usually dozens and dozens of picnic tables that are empty. Walk or pedal down the Silver Strand bike path, perhaps, and rest for awhile at a table. Then take out a book or your laptop or notepad. If you’d like to get up and stretch your legs, walk under the highway to the Pacific Ocean side, take your shoes off, walk on the beach and watch kitesurfers. 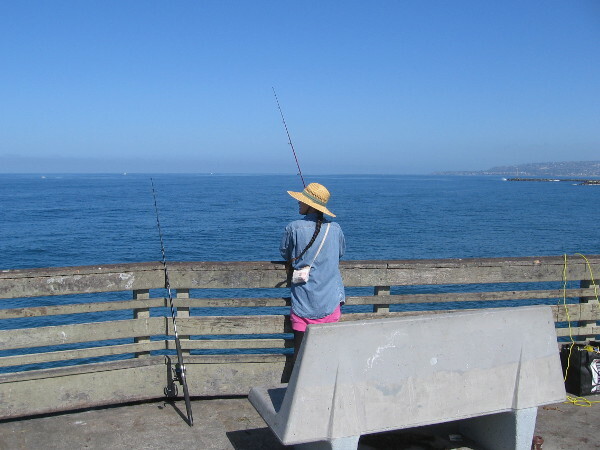 Sit near the end of the OB Pier high above the swelling blue ocean and you’re certain to feel inspired and alive. Any bench above the water on the Ocean Beach Pier. Sit on a bench out on the long Ocean Beach Pier and you’ll feel that you’re far from land–in a magical place between airy blue heaven and the rolling, living blue water below. When you glance up from your book or laptop, you’ll see fishermen sharing the rail with patient pelicans, and surfers bobbing below waiting for their perfect wave. But bring a jacket. The ocean wind can be chilly, even in summer. Many benches await thinkers, dreamers, readers and writers at Spanish Landing in San Diego. A spot beside San Diego Bay at Spanish Landing. This is another fine place to sit by the water. Spanish Landing is an uncrowded retreat from city life with a view of the marinas behind Harbor Island. You might hear aircraft taking off from nearby Lindbergh Field, but I seldom notice. There are many benches along the grassy park to choose from. Here you can also read interesting historical markers. With a little imagination, you might visualize Spanish explorers landing here many centuries ago. One of the many beautiful, peaceful spots that can be found throughout Liberty Station. Any bench at Liberty Station, particularly by the boat channel. 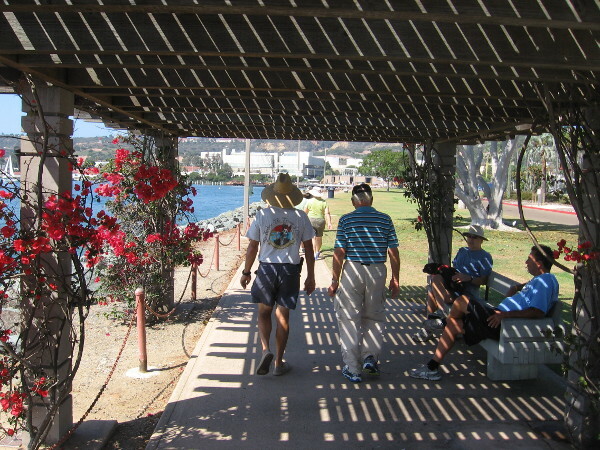 Liberty Station has many walking paths and benches where anyone can sit down to think or simply relax. My favorite spots overlook the boat channel. Light twinkles from the water, the breeze is pleasant, and paddleboarders and kayakers occasionally coast on by. There’s no hurry to do anything. If I write or read just a few words, I’m happy. 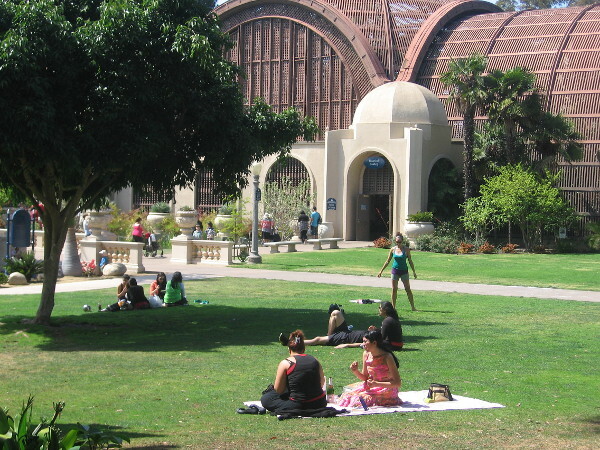 There are a couple of hidden benches not far from here in Balboa Park! Perfect for writers who like to observe people! A hidden bench beside the Timken Museum of Art. Against the north wall of the Timken Museum in Balboa Park, tucked behind a few trees, you’ll discover a couple of hard concrete benches. During a hot summer day they are so nice and cool! One can peer between foliage at the grassy area near the Botanical Building and reflecting pool, where people play, picnic and walk dogs. It’s like your own secret space in green heaven. But bring a seat cushion if you sit there for long! Where are your favorite places to read or write? Leave a comment! All of these photos are from Cool San Diego Sights. To see thousands of images from all around San Diego, simply navigate about my website! Do you enjoy reading philosophical short works of fiction? You might enjoy visiting Short Stories by Richard! I’m sure there are hundreds of great spots in San Diego! Spring is coming! And Switzerland is very, very beautiful! Previous Previous post: San Diego history at Old Town’s Wells Fargo museum. Next Next post: Creativity, expression, and one wonderful park.